With the New York Giants losing out on All-Pro guard Andrew Norwell, plan B must be initiated. Unfortunately, it requires the Giants and general manger Dave Gettleman to address the offensive line through the NFL Draft. With the No. 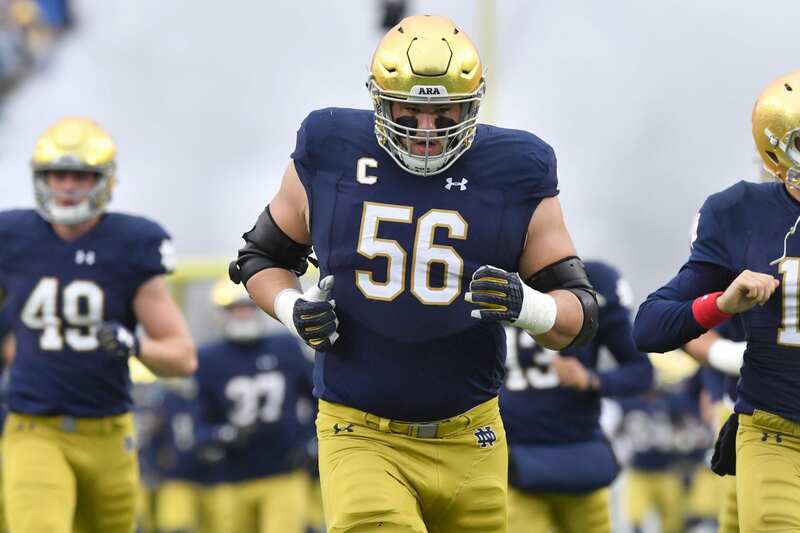 2 overall pick, taking either a quarterback or running back Saquon Barkley is atop the list, but now Notre Dame guard Quenton Nelson must also be considered at the position. For any team, taking a guard at No. 2 is plain foolish, so trading back for the Giants would be the most efficient move. In this instance, they can grab their guard for a great price, and they can acquire other picks/players to move forward with. If the Giants take a flier on the top-rated guard, they would immediately see an improvement on the line. Additionally, we can assume they will also be addressing the line through free agency, where players like Nate Solder, Justin Pugh, Josh Sitton and D.J. Fluker, are all waiting in the looms. Nelson is built like a pickup-truck; broad chest and extremely powerful limbs. His power is his greatest attribute. It helps him come out of blocks and move into the second-tier in the run-game. His agility and quickness is impressive as a guard. He’s an intriguing prospect entering the NFL this year. Additionally, he put up 35 reps on the bench press, earning second behind only Will Hernandez.